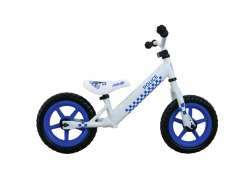 The largest and most affordable Online Rebel Kidz Balance Bike Shop! Rebel Kidz Balance Bike shop the largest and most affordable! Do you want to buy a Rebel Kidz Balance Bike online? Hollandbikeshop.com has all the Rebel Kidz Balance Bikes you're looking for. Rebel Kidz felt that something was missing in the balance bike market - something special. That's why Rebel Kidz decided to develop special balance bikes for children between the ages of 2 and 5 that leave nothing to be desired. Cool, stylish balance bikes that are great for developing their fine motor skills and sense of balance. At Hollandbikeshop.com you can find a wide choice of balance bikes by brands like Rebel Kidz. A child with a Rebel Kidz bike can take on the whole world! It will have less trouble switching from a balance bike to a regular bicycle with pedals, without needing training wheels. In our wide Children's Bicycle range on Hollandbikeshop.com you'll find Rebel Kidz balance bicycles in various colors, sizes and models, like 12 inch steel balance bikes in the colors orange, light blue and dark green. You're sure to find the balance bike by Rebel Kidz you're looking for here. Hollandbikeshop.com is a dealer of Rebel Kidz Balance Bikes and has a large and affordable range. We also often have Rebel Kids Balance Bikes on sale or in our outlet, so keep an eye on our sale button. The largest and most affordable Rebel Kidz Balance Bike shop!